2010 — According to Billboard Magazine, Nickelback’s album Dark Horse was the number one rock album of 2010, the top song of 2010 was Susan Boyle’s “I Dreamed a Dream” and Train’s “Hey Soul Sister” was the top-selling digital download of the year. Consequently, these facts all conspire statistically to my not letting you DJ my next party. Armenia — Armenian officials are getting tough with emo music and its Armenian teen fans, claiming that the gloomy music “undermines social stability” and even going so far as to check students for tell-tale goth signs of body piercings, black gloves, torn jeans and colors traditional to the emo palate. Assumedly, the crackdown will also greatly affect sales of Armenian clothing store տաք Topic. Cooper, Anderson — The long-time CNN anchor has announced that the title of his new daytime television show will follow in traditional Hollywood footsteps and be named, very simply, Anderson. This news comes as a great disappointment to Mrs. Shaw’s fourth-grade class at St. Louis, Missouri’s Theodore Roosevelt Elementary, who was holding out for Canderson Pooper. Gawker — Over the weekend, email addresses and passwords for over 200,000 Gawker Media users were hacked, prompting Gawker to recommend that its users change their User IDs and access information. After the announcement, the internet went deathly silent as over 200,000 Gawker users paused briefly from leaving snarky hipster comments on the sites to spend some time coming up with clever and hilarious new user names. Glee — According to set reports and tweets from the show’s stars, production on the hit Fox show Glee has been halted after several of the cast members allegedly have come down with tonsilitis. In other news, tonsilitis is the number one most searched and downloaded item on iTunes this week. Stumblin’ — Okay guys, I’m going to throw this one to you for a ruling. 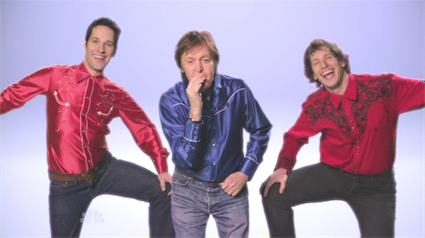 As you’re likely aware, Paul McCartney joined Paul Rudd as the musical guest on this weekend’s Saturday Night Live, which featured an SNL Digital Short riffing on both one particular line of Dolly Parton’s “9 to 5” and one line from Berlin’s “Take My Breath Away.” The piece also included Macca himself playing a tiny harmonica. Though I found myself delightfully giggly about it, I’m torn — is this gloriously meta-ridiculous or just stupid? I’ll hang up and wait for your answer. Thoughts?